Die Veneris, videlicet, 20 die Maii. Mr. Leat concerning Letters of Mart to indemnify Wrongs by the Spaniards. Scots Commissioners will send the Declarations to Scotland. Committee for the Safety of the Kingdom. Mr. Amsell recommended to the Living of Horton. Bill for a Synod, to settle the Doctrine of the Church. L. Keeper Lave to be absent. Bill for avoiding Actions in some Cases. A new Bill to be drawn. Message from the H. C. that they are ready for the Conference about Breach of Privilege. Message to the H. C. to sit a while. Mr. Jennings and Sir Philip Vernatti. 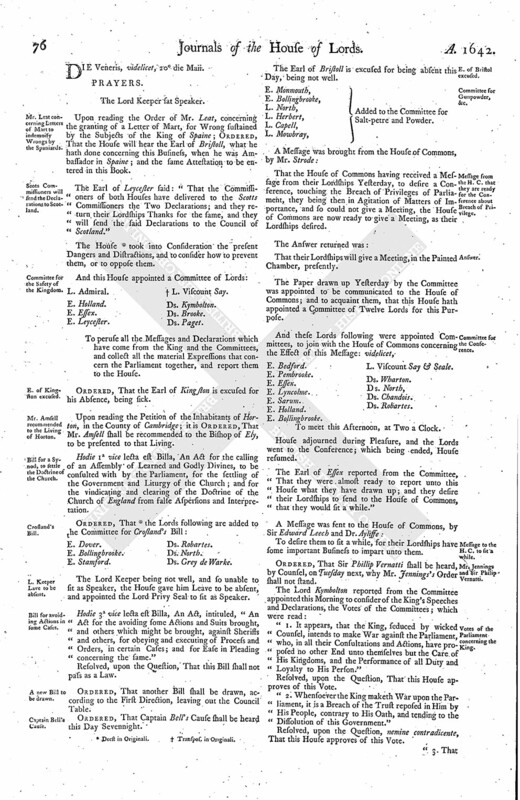 Votes of the Parliament concerning the King. 11 R. II. Rot. Parl. 1 H IV. Lord Herbert committed, for Words. Parliament's Petition to the King. Message from the H. C. for Committees to meet. and with an Order for 200 l. for the Town of Bandenbrigg. The Lord Keeper sat Speaker. Upon reading the Order of Mr. Leat, concerning the granting of a Letter of Mart, for Wrong sustained by the Subjects of the King of Spaine; Ordered, That the House will hear the Earl of Bristoll, what he hath done concerning this Business, when he was Ambassador in Spaine; and the same Attestation to be entered in this Book. The Earl of Leycester said: "That the Commissioners of both Houses have delivered to the Scotts Commissioners the Two Declarations; and they return their Lordships Thanks for the same, and they will send the said Declarations to the Council of Scotland." The House (fn. 1) took into Consideration the present Dangers and Distractions, and to consider how to prevent them, or to oppose them. E. Leycester. (fn. 2) L. Viscount Say. To peruse all the Messages and Declarations which have come from the King and the Committees, and collect all the material Expressions that concern the Parliament together, and report them to the House. Ordered, That the Earl of Kingston is excused for his Absence, being sick. Upon reading the Petition of the Inhabitants of Horton, in the County of Cambridge; it is Ordered, That Mr. Amsell shall be recommended to the Bishop of Ely, to be presented to that Living. Hodie 1a vice lecta est Billa, An Act for the calling of an Assembly of Learned and Godly Divines, to be consulted with by the Parliament, for the settling of the Government and Liturgy of the Church; and for the vindicating and clearing of the Doctrine of the Church of England from false Aspersions and Interpretation. The Lord Keeper being not well, and so unable to sit as Speaker, the House gave him Leave to be absent, and appointed the Lord Privy Seal to sit as Speaker. Hodie 3a vice lecta est Billa, An Act, intituled, "An Act for the avoiding some Actions and Suits brought, and others which might be brought, against Sheriffs and others, for obeying and executing of Process and Orders, in certain Cases; and for Ease in Pleading concerning the same." Resolved, upon the Question, That this Bill shall not pass as a Law. Ordered, That another Bill shall be drawn, according to the First Direction, leaving out the Council Table. The Earl of Bristoll is excused for being absent this Day, being not well. E. Monmouth, Added to the Committee for Salt-petre and Powder. That the House of Commons having received a Message from their Lordships Yesterday, to desire a Conference, touching the Breach of Privileges of Parliament, they being then in Agitation of Matters of Importance, and so could not give a Meeting, the House of Commons are now ready to give a Meeting, as their Lordships desired. That their Lordships will give a Meeting, in the Painted Chamber, presently. The Paper drawn up Yesterday by the Committee was appointed to be communicated to the House of Commons; and to acquaint them, that this House hath appointed a Committee of Twelve Lords for this Purpose. E. Bollingbrooke. L. Viscount Say & Seale. To meet this Afternoon, at Two a Clock. House adjourned during Pleasure, and the Lords went to the Conference; which being ended, House resumed. The Earl of Essex reported from the Committee, That they were almost ready to report unto this House what they have drawn up; and they desire their Lordships to send to the House of Commons, that they would fit a while." To desire them to sit a while, for their Lordships have some important Business to impart unto them. Ordered, That Sir Phillip Vernatti shall be heard, by Counsel, on Tuesday next, why Mr. Jennings's Order shall not stand. 1. It appears, that the King, seduced by wicked Counsel, intends to make War against the Parliament, who, in all their Consultations and Actions, have proposed no other End unto themselves but the Care of His Kingdoms, and the Performance of all Duty and Loyalty to His Person." Resolved, upon the Question, That this House approves of this Vote. 2. Whensoever the King maketh War upon the Parliament, it is a Breach of the Trust reposed in Him by His People, contrary to His Oath, and tending to the Dissolution of this Government." Resolved, upon the Question, nemine contradicente, That this House approves of this Vote. 3. That whosoever shall serve or assist Him in such Wars are Traitors, by the fundamental Laws of this Kingdom, and have been so adjudged by Two Acts of Parliament, and ought to suffer as Traitors." Resolved, upon the Question, That this House approves of this Petition now read; and that it be sent to the King. The Lord Herbert of Cherbery, in Debate of the Second Vote, speaking these Words, "I should agree to it, if I could be satisfied that the King would make War upon the Parliament without Cause:"
Upon this, he was commanded to withdraw, which accordingly he did; and because it was now late, it is Ordered, That the Lord Herbert of Cherbery shall stand committed to the Custody of the Gentleman Usher for the present, until this House take this Business into further Consideration. Your Majesty's loyal Subjects, the Lords and Commons in this Parliament, do humbly represent unto Your Majesty, That, notwithstanding Your frequent Professions to Your Parliament and the Kingdom, and the late Expression, in Your Answer of the 13th of May, to the Petition of the County of Yorke, that your Desire and Intention is only the preserving of the true Protestant Profession, the Laws of the Land, the Liberty of Your People, and the Peace of the Kingdom: Nevertheless, with great Grief We perceive, by Your Speech of the 12th of May, and the Paper printed in Your Majesty's Name, in the Form of a Proclamation, bearing Date the 14th of May, and other Evidences, That, under Colour of raising a Guard to secure Your Person, of which Guard, considering the Fidelity and Care of Your Parliament, there can be no Use, Your Majesty doth command Troops, both of Horse and Foot, to assemble at Yorke, the very Beginnings whereof were apprehended by the Inhabitants of that County to be an Affrightment and Disturbance of Your Majesty's liege People, as appears by their Petition presented to Your Majesty; the Continuing and Increase of which Forces is to Your Parliament, and must needs be, a just Cause of great Jealousy and Danger to Your whole Kingdom: Therefore we do humbly beseech Your Majesty to disband all such Forces as, by Your Command, are assembled; and, relying for Your Security, as Your Predecessors have done, upon the Laws and the Affections of Your People, You will be pleased to desist from any further Designs of this Nature, contenting Yourself with Your usual and ordinary Guards; otherwise we shall hold ourselves bound in Duty towards God, and by the Trust reposed in us by the People and the fundamental Laws and Constitutions of this Kingdom, to employ our Care and utmost Power to secure the Parliament, and to preserve the Peace and Quiet of the Kingdom. To desire a Conference, by a Committee of both Houses, touching a Petition to be presented to His Majesty. That the House of Commons will give a present Meeting, in the Painted Chamber, as is desired. House adjourned, and the Lords went to the Conference; which being ended, the House was resumed. To let their Lordships know, that the House of Commons have appointed a Committee of their House, to join with a Committee of Lords, to meet at the Time and Place appointed, desired this Morning, at the Conference. Ordered, That the Treasurers for the Loan and Contribution-money, at London, shall pay unto Mr. Nic. Loftus, Deputy Treasurer at War for Ireland, or his Assignee, Ten Thousand Pounds, out of the Monies as shall come in upon the said Act, to be employed for the Affairs of Ireland." 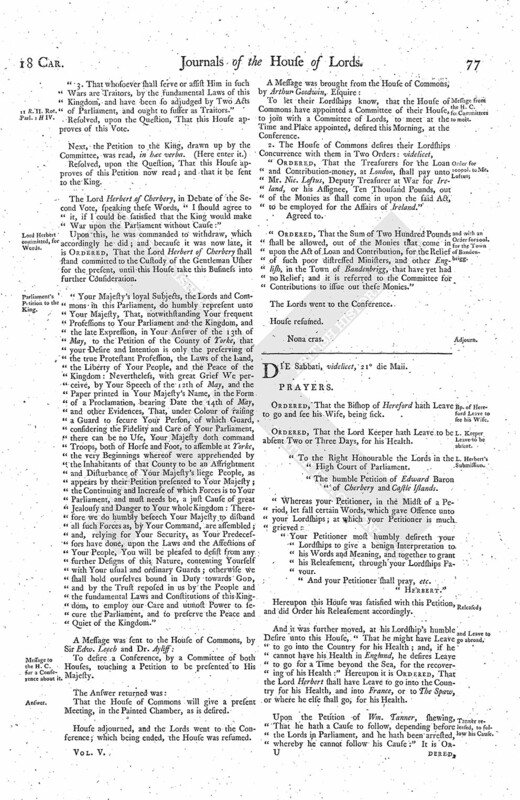 Ordered, That the Sum of Two Hundred Pounds shall be allowed, out of the Monies that come in upon the Act of Loan and Contribution, for the Relief of such poor distressed Ministers, and other English, in the Town of Bandenbrigg, that have yet had no Relief; and it is referred to the Committee for Contributions to issue out these Monies.